My party of three started at Wingstop, a national restaurant chain that opened its first location in Westchester at 110 Abendroth Ave. on Dec. 14, 2016. You order and pay at the counter of the 2,100-square-foot, aviation-themed restaurant which seats 54 inside and will also have seating outside on the deck now that the weather is warming. The open kitchen allows you to watch as your wings are tossed in a large bowl to coat them with one of the 11 flavors of sauce or one rub. The newest, not even listed on the takeout menu, is Brazilian Citrus Pepper which joins the likes of Hickory Smoked BBQ and Mango Habanero. When your order is ready—it takes about 15 minutes—it is delivered to your table or you retrieve it from the pick-up window. We chose the eight classic wing combo which allows you two flavors, one dipping sauce, fries or vegetable sticks ($9.99) and a 20-ounce soft drink. Since we chose fries, an order of veggie sticks cost $1.19 extra. The Original Hot sauce, described as “a blend of heat and tang,” was bright red and had the perfect spiciness while the Louisiana Rub, our second choice, left the other four wings only lightly colored. It was also tasty, less messy and pleasingly spicy. However, the wings themselves were not very big or meaty. Those with the rub were crispy, the others a tad hard. The bleu cheese dip, one of four dipping sauces to pick from, was watery with chunks of bleu cheese in it. Ranch, honey mustard and cheese sauce are the other options. Veggie sticks consist of both carrots and celery, and the carrots are unusually wide. We laughed about the carrots at first, but I actually liked them a lot. The hand-cut fries flavored with seasoned salt were delicious. We didn’t ask for anything special, so I guess we got the fry seasoning. Other choices include Cajun, lemon pepper or parmesan. You can also get the fries topped with cheese. Separately an order costs $2.65 or $3.69. With cheese they go for $3.39 or $4.59. 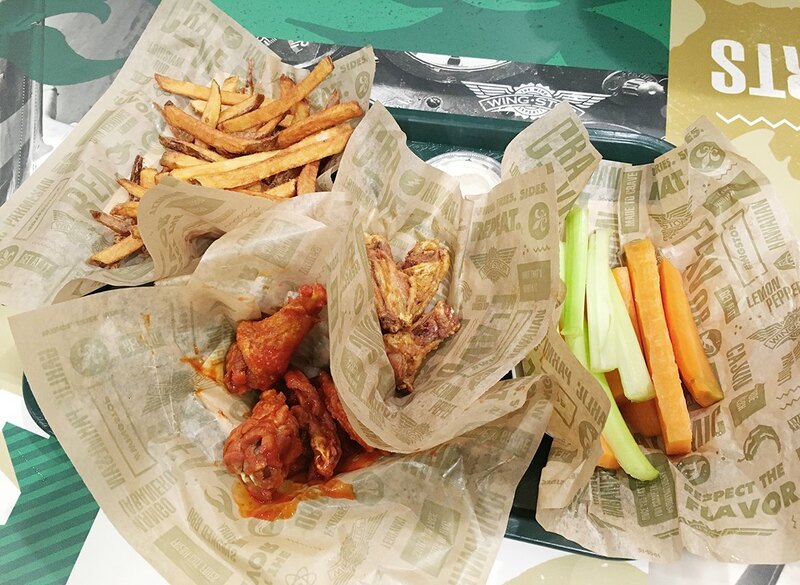 Everything was served on a tray with each item nestled in special Wingstop wax paper placed inside individual cardboard containers. However, there were no napkins, just a roll of brown paper towels to rip off in the center of the dining room, and no paper plates or containers to eat out of that I could see. Perhaps you could ask for them. Classic and boneless wings come in combos and packs or by the piece and cost the same. Combos have six ($8.79) to 12 ($13.09) wings, packs 24 ($27.29) to 100 ($92.19) and pieces eight ($6.89) to 100 ($79.29). Packs generally include fries and veggie sticks. Besides wings, there are also combos and packs of crispy tenders which are also available by the piece. In addition to veggie sticks, sides include coleslaw, potato salad, baked beans and baked rolls. David Lewis is managing the restaurant for franchisee Brian Robinson. The Port Chester location is the first of many Wingstops Robinson expects to open. Wingstop, located adjacent to the empty paved lot that was once a parking lot across from Buffalo Wild Wings, is open every day from 11 a.m. to midnight. If you want wings to take out or to be delivered, you can call 939-0200 or order online at wingstop.com. While Wingstop is more of a fast food establishment, Buffalo Wild Wings, located in The Waterfront at Port Chester complex at 44 Westchester Ave., is a happening sports bar and restaurant with a much larger menu. However, I would not go there unless I was craving wings or wanted to grab a beer and watch a sporting event on their many TVs. BWW is also a national chain which now has locations in every state and is beginning to open restaurants around the world. The wings at Buffalo Wild Wings also come in boneless and traditional with tenders a third option. All three can be flavored with a choice of five different dry seasonings or 16 signature sauces ranging from Salt & Vinegar to Blazin’ with Sweet BBQ, Parmesan Garlic and Mango Habanero in between. BWW opened in Port Chester June 5, 2006, so it has been a thriving downtown business for almost 11 years, outlasting both Applebee’s and Panera Bread in The Waterfront retail, dining and entertainment destination. On my comparative wing-tasting outing last month, I tried to compare similar styles and sauces, so we went with the small order of 10 traditional wings ($11.79), half with Spicy Garlic sauce and half with Buffalo dry seasoning. The traditional wings are described on the menu as “authentically awesome, award-winning Buffalo, N.Y. style wings.” They come with celery or carrots (we got a combination of the two) and bleu cheese or ranch dressing for dipping. The thicker, creamier bleu cheese dipping sauce was more to my liking than that at Wingstop. Wing portions range from snack ($8.79) to large ($19.99). Snack includes five wings, small 10, medium 15 and large 20. If you’re having a big crowd, the party menu shows 50 wings for $46.49, 100 for $87.99 and 150 for $128.99. Traditional wings are half price on Wing Tuesdays and you get a discount on boneless wings on Boneless Thursdays. I had not been at BWW in some time but recalled that the Spicy Garlic sauce was exceptional—spicy but not overpowering— which is still my assessment. The Buffalo seasoning was similar in spiciness but obviously dryer and less messy to eat. The wings here are “spun” by hand to ensure each one is perfectly coated in sauce or seasoning, according to the menu, but you can’t watch that being done as you can at Wingstop. They were much meatier and not at all hard as they were at Wingstop and some other places I’ve ordered wings from in the past. I’m sure the deep fat frying process is tricky and can produce different results each time. To fairly compare, we also ordered a side of natural-cut French fries ($3.59) and added a side of beer-battered onion rings ($5.59). The fries were fine but not as good as Wingstop’s and the others in my party said the onion rings were excellent, but I only had one bite because they are not my cup of tea. They came with a yummy Southwest dipping sauce. You can add cheese to the fries for $.55, bacon for $1.30 and your favorite dry seasoning at no charge. 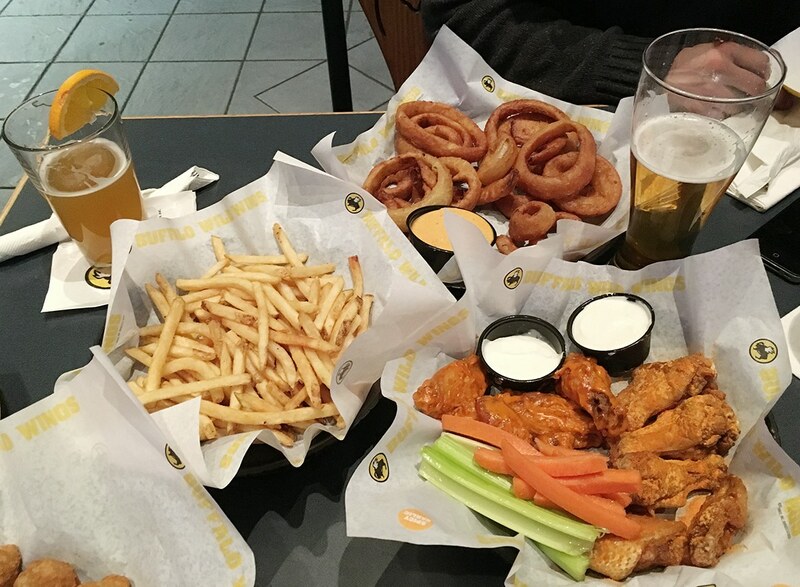 Here, too, the wings and fries, as well as the onion rings, were served in cardboard containers lined with special BWW wax paper. Each person then received their own empty container to put their food in rather than just picking which I found more sanitary. We also got plenty of napkins. Buffalo Wild Wings, which is open from 11 a.m. to 11 p.m. Sunday through Thursday and from 11 a.m. to midnight Friday and Saturday, offers takeout but not delivery except through GrubHub. You can order online at buffalowildwings.com or call 690-9453 to avoid waiting. Just by chance I went to The Pub at Doral Arrowwood on Anderson Hill Road in Rye Brook shortly after visiting Wingstop and Buffalo Wild Wings and found their wings to be the best of all. The Pub serves only Classic NY Buffalo Wings or Boneless Wings (10 pieces for $12) in naked, mild, medium or hot, Thai Chili or Bourbon Brown Sugar flavors. After we chose the Classic Buffalo flavor, our waiter, who was Latino, recommended we order the mild variety, so we took his advice and thank goodness we did because even that was spicy. I can’t imagine what the hot must be like! These wings were meaty, flavorful and came with bleu cheese dressing and celery sticks.